Sponsored by the Y&S Nazarian Center for Israel Studies. Co-sponsored by the Department of Art, Department of Art History, Department of Gender Studies, Department of Near Eastern Languages and Cultures, Center for Near Eastern Studies, Center for the Study of Women, Center for the Study of International Migration, and the Soraya Sarah Nazarian Program in Fine Arts, Whizin Center, AJU. In this symposium, art scholars and artists will examine various works of contemporary Israeli art to understand the multiple identities and varieties of experience - Jewish, Palestinian, immigrant, female, male, LGBTQ – which are unique to Israel and also, in many ways, universal. The artists will discuss how their artwork reflects personal narratives regarding national, ethnic and gender identity, and dynamics of inclusion-exclusion. The discussion will integrate multiple disciplines, including art, art history, gender studies, Middle East studies, and migration studies. Raida Adon - Born in Akko in northern Israel to a Jewish father and a Muslim mother, Adon’s artworks emerge from her complex biography, addressing conflicted nations and the relationship between two interrelated societies. The image of the woman is a recurring motif in her work, as a metaphor for the post-1948 geographic space of Israel/Palestine and reflecting the artist’s own quest for rootedness, while alluding to many refugee crises. Adon is a graduate of the Bezalel Academy of Arts and Design in Jerusalem. She has shown work and performances at museums as well as theatre festivals around the world. Gannit Ankori (Moderator) - Professor Gannit Ankori is an internationally-recognized art historian who has published widely on contemporary art from a global perspective, with emphasis on issues pertaining to gender, national identity, religion, trauma, exile, hybridity and their manifestations in the creative arts. She is the author of Palestinian Art (Reaktion Books, London, 2006) and has curated numerous exhibitions on Israeli and Palestinian art. She is also internationally renowned for her books, articles, and exhibitions on the Mexican artist Frida Kahlo. Ankori is Professor of Art History and Theory, Chair of Israeli Art at the Department of Fine Arts and the Schusterman Center for Israel Studies, and Head of the Division of Creative Arts at Brandeis University. Zoya Cherkassky - Acclaimed Israeli artist Zoya Cherkassky was born in Kiev in 1976 and immigrated with her family to Israel in 1991. 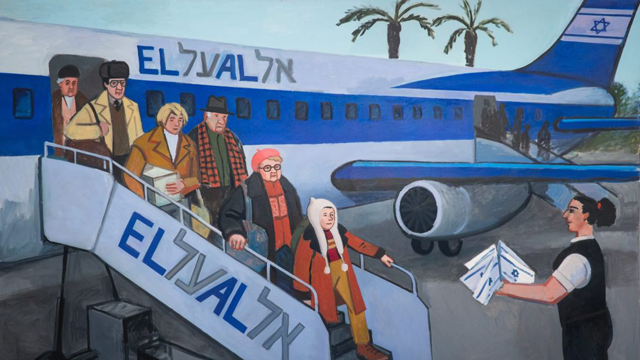 The Israel Institute Visiting Artist's paintings address her personal experiences and the collective experience of the million-strong Russian immigrant influx to Israel – often marked by unflattering stereotypes – and her conflicted Jewish identity. Cherkassky's work has been shown at major museums and institutions worldwide, including the Israel Museum; Tel Aviv Museum of Art; Martin Gropius Bau, Berlin; and MARS Center for Contemporary Arts, Moscow. Roey Victoria Heifetz - Heifetz is an artist from Jerusalem currently living in Berlin. Her most recent work includes videos and drawings of transgender women (primarily) in communities in Berlin, Israel and Los Angeles, including self-portraits. The pieces examine the transgender body and the body in general, and raise issues such as gender change, anxieties, old age, regret, femininity, motherhood, pain, and fear of one's self and of society. Her work has been shown in group and solo exhibitions around the world. Heifetz studied at the Bezalel Academy for Arts and Design in Jerusalem (BFA, MFA) and the School of the Museum of Fine Art in Boston. She is the recipient of the 2018 Ann and Ari Rosenblatt Prize in Visual Art. Sagi Refael - Refael is an Israeli art historian and curator whose writing and curating focuses on gender issues and particularly representations of masculinity in art and visual culture. He has curated and/or published on contemporary art exhibitions at the Tel Aviv Museum of Art, Museum of Israeli Art (Ramat Gan) and galleries in Israel, Berlin, and Los Angeles. In 2017, Refael founded IAILA ("YayLA") - Israeli Art in Los Angeles - a private, educational and commercial initiative dedicated to cultural exchange and artistic cross-pollination between the US and Israel.